Budgeting is something that many people think sounds ridiculously restrictive and boring. Some might even believe that they don’t have enough money to even consider drafting a budget in the first place. However, budgeting is a lifesaver, and the good news is anyone can do it. In this post, I share with you how to make a monthly budget and give you tips on how you can actually stick it. Want to start your own blog and make money doing it? I would love to teach you exactly how right here on this blog for free! Click here and let’s get started. Budgeting is simply planning how you are going to spend, save or even invest your income. You can draft a bi-weekly budget or a monthly budget, the important thing is that you come up with a budget plan that works well for you. Why Do I Need To Budget? Having a budget will help you gain control of your finances, and you will also be able to see what you’ve potentially been wasting money on. Learning how to make a monthly budget is also a blessing in disguise as it could even make you rich because you will have some money leftover to save or invest. Budgeting will keep you from spending sleepless nights worrying about how you are going to make it to the next paycheck because of that impulsive buy that de-railed everything. Your money is planned for and assigned to something in each category of your budget. The bills are assigned some money, the food is covered, transportation is included, and even leisure and clothes shopping is covered. You are not going through life aimlessly spending on whatever catches your eye. Budgeting brings you so much peace and freedom. Sure it feels a little restrictive and some people might even find the sheer thought of sitting down to draft a budget to be mind-bogglingly dull. But, if you set aside just a little time every month to plan your income by writing down a roadmap of how you’ll spend your money, you won’t lose sleep wondering where you are going to get the money to make ends meet. When I started working on my first budget, I was surprised at the amount of money I spent on stuff that I really didn’t need. Having a debit card and being able to shop without actually handling actual bank notes means it’s becoming increasingly easy to overspend. Having a budget helps you see all this in black and white. Being aware of not only what you have coming in, but also how much you are paying out is essential and will help you manage your money more efficiently and keep you from ever going broke. I honestly believe that one of the best ways to make sure that you save money is to set yourself some goals. This could be long-term goals or short-term goals. It could be that you want to save for a new car, new furniture or perhaps a family vacation. You may also save for that very special birthday party or an outfit that you’ve been eying for months. The main thing is that you have something that gives you the inspiration to save. Making a monthly budget will prove really helpful when you want to save some money every month. You have better control of your money and are able to increase your savings by reducing the number of funds allocated to certain parts of your budget categories where you might be spending more. If you are trying to battle your debts, then one of the simplest things that you can do is to budget the money that you do have. When you budget your money, the risk of you overspending or of buying things on impulse is significantly reduced. That means that you will have more money left over to use towards your debt payments each month. So, if your goal is to pay off your debt fast, with a monthly budget, that goal may well be attainable. Scrambling to make ends meet can be extremely stressful because you feel you just don’t have enough money to pay all your monthly bills. And if an emergency pops up, you panic and maybe even end up putting yourself in more debt. Curbing the amount of money you spend on leisure activities such as dining out. Finding a side hustle to earn extra money. Cutting out/ cutting down on credit card usage. Selling stuff that you no longer need (we all have something around our house that we don’t need anymore). Learning how to make a monthly budget will give you the tools you need to help you track your spending. You will know where exactly your money is going and figure out ways to either reduce costs by rearranging the numbers or finding ways to earn extra money. 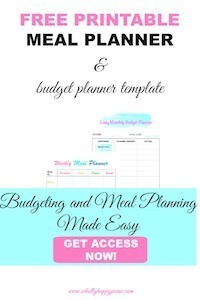 To get started you will need a budget planner template. You can download one from my printable library for free by entering your email below. Firstly, you want to fill in your regular monthly or bi-weekly income after taxes. Include all sources of income if you have more than one. When that’s done, go through your bank records or statements and write down what you spent your money on during the last three months. Write down the name of each company you are paying money out to and the amount. Make a note of how much you spend on your fixed costs (mortgage, insurance, savings, etc.) and variable costs (e.g., groceries, clothes, etc.) per month. Make sure you record every penny. You want a clear picture of what your monthly expenditure is. List your all your expenses on a piece of paper and add them all up by category to get the total for each group per month. Add the total results to the appropriate category ( under the ‘Actual’ column) on your budget planner. The amount you get as your ‘Total cost’ should be lower than or equal to your income. If there is more going out than there is coming in, then you are spending beyond your means. You need to go through your list of variable costs (leisure activities, dining out, etc.) and get rid of some of the luxury items. You might also want to look at other ways to curb expenses. Turning lights off when no one is using a room in your house, for example, could save you money. As does limiting yourself to buying takeaways to just once per week instead of every other day. I’ll be the first to admit this (learned the hard way). Drafting a budget is the easy part, sticking to it, however, can be tricky if you are not careful. What I have learned is that when you create a budget, you want to make sure that you include the things that make up your acceptable standard of living while staying within your means. Budgeting should not make you feel like you are limiting the fun stuff in your life, on the contrary. A budget is a plan of how you are going to use your income effectively. And because every penny is assigned to a particular category, you avoid overspending and thereby save more money. Give yourself a monthly allowance to spend on home decor, hobbies, and other leisure activities. That way, you have enough money assigned to stuff that makes you busy and happy. As long as you are putting some of your monthly income into a savings account and the other categories are covered. Take cash with you instead of your visa/credit card when you go out on the town for some fun with friends. You won’t spend what you don’t have. You might want to try out the 5 dollar meal plan where you get a pre-made weekly meal plan and shopping list. Your meal planning is done for you and you save tons. Shopping on a full stomach will keep you from buying stuff on impulse. A study actually suggests that you are more likely to spend more money at the grocery store when you shop on an empty stomach. Pack lunch to take with you to work so that you are not tempted to spend money at a restaurant on food. Learning how to make a budget and sticking to it might be a bit hard at first. But once you have done it two to three times, you’ll be a pro. Consistency is key, so budget, stick it to plan and you should start to see great results in no time. If you have any comments or questions about how to make a monthly budget, let me know in the comments section down below.